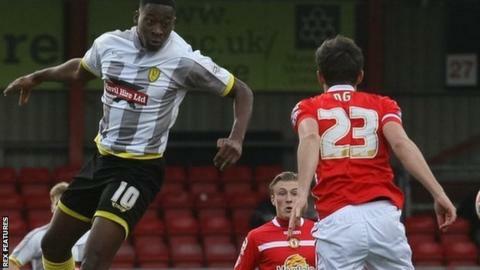 League One strugglers Crewe held leaders Burton Albion to a draw in a game of few clear-cut chances. Brad Inman then fired at goal from 20 yards, stinging the palms of Jon McLaughlin as Crewe sought a second. Crewe, who lost defender Jon Guthrie late on with a cheekbone injury, remain seven points from safety with 11 games left to play. The Brewers maintain their four-point advantage over second-placed Wigan, now nine points clear of third-placed Gillingham. "Drawing against the team that is top of the league should give us confidence because it shows that on our day we can compete with the very best. "But, in the context of our situation, we need to be getting three points, especially from our home games. It is still a good point and I don't think it's two points lost. "Overall a draw was fair. There was not a lot between the two sides. We took the lead again but we didn't hold onto it long enough. We have taken the lead in 17 games and only gone on to win six, so that tells its own story." "Jon McLaughlin's not had much to do. We should have worked their goalkeeper a bit more. "We had some brilliant situations today which we didn't turn into clear cut chances and ultimately we were just lacking that little bit of quality in the final third to get us the winner. "I was pleased the way the players responded to going a goal down and the way we got back into the game and deserved out equaliser and were looking to win the game but when you're a goal down away from home then you end up with a point, it's not a bad result." Match ends, Crewe Alexandra 1, Burton Albion 1. Second Half ends, Crewe Alexandra 1, Burton Albion 1. Corner, Burton Albion. Conceded by George Cooper. Attempt missed. Hamza Choudhury (Burton Albion) right footed shot from outside the box misses to the right. Attempt blocked. Lucas Akins (Burton Albion) right footed shot from the left side of the box is blocked. Substitution, Burton Albion. Hamza Choudhury replaces Callum Butcher. Attempt missed. Robbie Weir (Burton Albion) right footed shot from outside the box misses to the right. Corner, Burton Albion. Conceded by Harry Davis. Damien McCrory (Burton Albion) is shown the yellow card for a bad foul. Attempt missed. Philip Edwards (Burton Albion) left footed shot from the right side of the box misses to the left. Corner, Burton Albion. Conceded by Zoumana Bakayogo. Ben Nugent (Crewe Alexandra) is shown the yellow card. Corner, Burton Albion. Conceded by Ben Nugent. Corner, Burton Albion. Conceded by James Jones. Substitution, Crewe Alexandra. Harry Davis replaces Jon Guthrie because of an injury. Delay in match Jon Guthrie (Crewe Alexandra) because of an injury. Attempt missed. Charlie Kirk (Crewe Alexandra) left footed shot from outside the box is close, but misses to the left. Corner, Crewe Alexandra. Conceded by Philip Edwards. Attempt blocked. Bradden Inman (Crewe Alexandra) right footed shot from the centre of the box is blocked. Substitution, Burton Albion. Tom Naylor replaces Mason Bennett. Attempt saved. Mark Duffy (Burton Albion) right footed shot from outside the box is saved in the top left corner. Foul by Mason Bennett (Burton Albion).